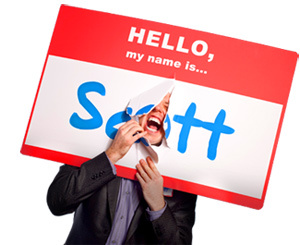 Be "Thee," Not "A" - HELLO, my name is Scott! When I started my company in 2003, I knew the competition was fierce. I knew there were thousands of other authors, speakers and consultants out there. And I knew that most of them were twice my age, had three times my knowledge and four times my experience. Well then. Looks like I’ve got some reading to do, I thought. So I spent the next two years doing just that. Researching. Annotating. Learning. Pouring over hundreds (nah, probably thousands) of print and online resources to expand my expertise. It appeared that all these resources on communication, networking, first impressions, connecting and the like … had left something out. It was musical. Emotional. Visual. A little long, but still powerful. And then another cool thing happened. I started reading a lot of marketing books, namely, Selling the Invisible, by Harry Beckwith. 1. If you do not have a focus, soon you will not have a business. 2. Rather than sacrificing opportunities, a narrow focus often creates opportunities. 3. So: to broaden your appeal, narrow your position. 4. And therefore: go where others aren’t. And that’s what approachability was. A new lens. A new paradigm. A new philosophy. A new and narrower (pardon the term)…approach! 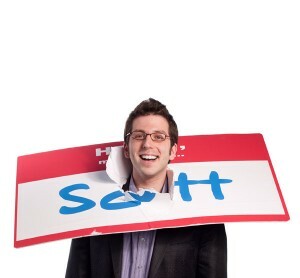 …but as THEE APPROACHABILITY expert. Focused. Narrow. Where others weren’t. AND THE BEST PART: there WAS no competition! Are you A time management expert? Or are you THEE time management expert…FOR NURSES? Are you A small business consultant? Or are you THEE small business consultant…FOR DRY CLEANERS? Or are you THEE personal trainer…FOR WORKING MOTHERS? Or are you THEE financial planner…FOR FAITH-BASED NON-PROFITS? Are you THEE or A?